Skydrop is like having someone optimizing your lawn watering, 24/7. It connects to your wifi network (you’ll need a strong signal) and replaces your existing sprinkler box. Skydrop can consider things like sprinkler type, sun exposure, soil type, and ground slope to water efficiently and minimize wasted water. Dimensions: 10" x 3.25" x 2"
Really innovative and great product! I love it! It was very easy to install, and when I did have a questions, customer service immediately and clearly explained how I needed to do what I was trying to do. I have set up my lawn so that it is watering correct amounts for each of the different zones, and I can monitor that wherever I am. I love to see its projections for what it will do the next week, dependent on our weather--heat, sunshine and precipitation. Control Skydrop with its intuitive jog dial or by downloading the Skydrop app to manage multiple zones in your yard. 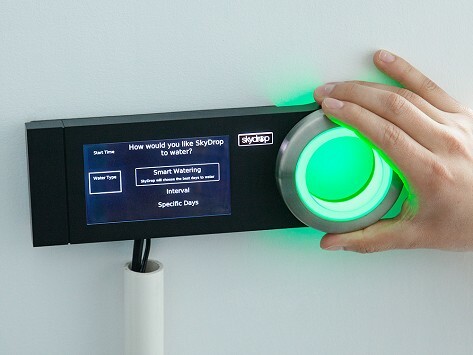 With customizable settings for sprinkler type and factors like sun exposure, soil type, and ground slope, Skydrop maximizes green while minimizing water use and expense. A beautiful lawn has never been so smart and easy.